It goes very close to requiting the notion that you can write successfully for beginners and, at the same time, define the field. 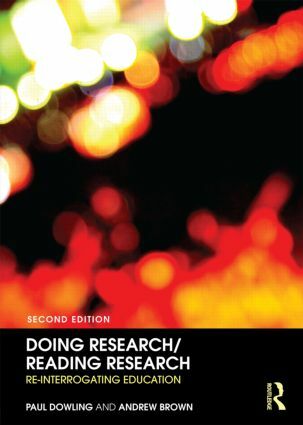 (Brian Davies, reviewing the first edition of Doing Research/Reading Research for the International Journal of Social Research Methodology). Paul Dowling is Professor of Education and Director of Postgraduate Research in the Faculty of Culture and Pedagogy at the Institute of Education, University of London. His other publications include Sociology as Method: Departures from the Forensics of Culture, Text and Knowledge (2009, Sense) and The Sociology of Mathematics Education: Mathematical Myths/Pedagogic Texts (1998, Falmer Press). Andrew Brown is Professor of Education and Dean of the Doctoral School at the Institute of Education, University of London. He has worked as an international consultant for major education development agencies. His other publications include Professional Doctorates: Integrating Professional and Academic Knowledge (with David Scott, Ingrid Lunt and Lucy Thorne, 2004, Open University Press) and Digital Technology, Communities and Education (World Yearbook of Education 2004, edited with Niki Davis, Routledge).